Sometimes, people bring fears with them into the kitchen. It’s something Hsiao-Ching Chou has seen first hand, both in her time as a food editor and a cooking instructor. It’s a mindset Chou took great care to avoid as she developed her first cookbook, “Chinese Soul Food: A Friendly Guide to Homemade Dumplings, Stir-Fries, Soups & More,” released earlier this year. While there’s no shortage of cookbooks centered around Chinese fare, Chou wanted to create a “safe space” where people wouldn’t be afraid to try. “I felt like what was missing was not so much that the recipes hadn’t been written down in some way in the past, but it was just a certain tone, and a certain voice, and a certain environment to encourage people to cook, and my whole philosophy was that I wanted to create an on-ramp for the casual home cooks,” she said. Chou — who will host a cooking demonstration at the Magnolia Farmers Market on Saturday from 10:30 a.m. to noon — also wanted to stress that cooking doesn’t have to be an “all or nothing” endeavor. “What I want to just remind people is that you just have to keep trying, and it’s okay if you make a mistake, you can learn from that,” she said. 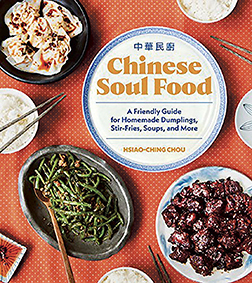 The cookbook features a bevy of everyday recipes that Chou grew up with — and also includes chapters on holiday fare and some slightly Americanized Chinese dishes, like Mongolian beef — with the intention of providing a range of techniques that allow home cooks to improvise once they have the basics down pat. To that end, making sure the recipes were well-written — and testing them accordingly — was of the utmost importance. She shied away from over-styled photographs as well, again in the name of making the recipes accessible. They too serve as a learning tool. “I wanted to make sure that the photographs were as real to life as possible, so when people made these recipes at home, that their dish would resemble what was in the photographs,” she said. The cookbook was a long time coming for Chou, who had aspirations to write one when she was a full-time food editor with the Seattle Post-Intelligencer. But in hindsight, she doesn’t regret waiting until now. Since it’s release in January, the book has done well, Chou said, with a reprint ordered by the publisher within two months. While e-books have gained in popularity in recent years, a digital format can’t quite replicate what a hard-copy cookbook provides. “There’s something that’s still very tangible and visceral about this act of having a meal and sharing a meal, and a cookbook is an extension of that because it imparts this knowledge, it imparts the values of cooking, and they’re just beautiful to look at,” she said. In addition to her farmers market appearance, Chou will also appear at Metropolitan Market in Magnolia (3830 34th Ave. W.) on Sept. 22 at 2 p.m. For more information, or to purchase the book, visit www.mychinesesoulfood.com.